“It went well because we had one guy in the break,” Bugter said. “That got caught with eight kilometres to go, and then I knew the team was going to pull me to the front. I had good legs to win the sprint, so it was a perfect day. Matteo Cigala (Westmeath Viner-Caremark – Pactimo) was the best county team rider in eighth, while Richard Maes (Kerry Killarney) was the best Irishman on such a squad. 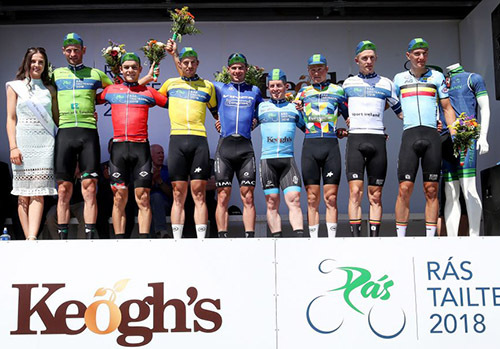 The 140.4 kilometre stage began in Tipperary and featured a long-distance breakaway of six riders. This featured Rory Townsend (Britain Canyon Eisberg) and Jason van Dalen (Netherlands Delta Cycling X), the instigators of the move, as well as Martin Frazer (Britain Saint Piran Elite Cycling Team), Curtis White (USA Jelly Belly P/B Maxxis), Samuel Tillett (Wales Racing Academy – National Team) and Seán O’Malley (Galway Gerry McVeigh Cars – DoorMotion). Townsend and van Dalen held on longest out front but were eventually caught with eight kilometres left. Bugter was then quickest at the finish. Benjamin Wolfe (USA Jelly Belly P/B Maxxis) at 15 seconds and Jake Gray (Ireland National Team) one second further back. Stage three of the Rás Tailteann ran from Tipperary to Listowel. In contrast to Monday’s wet second stage, it was run off in bright sunshine and in mild to warm conditions. It lacked any categorised climbs, and was predicted to end in a bunch gallop. However many riders were determined to try to rock this expectation, attacking from the drop of the flag to try to frustrate the sprinters. Andrew Turner (Britain Team KTM) was one of the most active but he, and others, were unable to break the elastic. Then, 34 kilometres in, two riders attacked, namely Rory Townsend (Britain Canyon Eisberg) and Jason van Dalen (Netherlands Delta Cycling X). They built a small lead that fluctuated between ten and 35 seconds over the next 20 kilometres. Several pairs of riders tried to bridge at various points but were unable to do so. A more successful chase happened after approximately 55 kilometres. Martin Frazer (Britain Saint Piran Elite Cycling Team), Curtis White (USA Jelly Belly P/B Maxxis), Samuel Tillett (Wales Racing Academy – National Team) and Seán O’Malley (Galway Gerry McVeigh Cars – DoorMotion) set off in pursuit, while at the same time the peloton backed off on its efforts to control things. Van Dalen had started the day eighth overall, 17 seconds back, and was highly motivated to gain time. His chances were boosted when the chasers made the junction at kilometre 70. The peloton at that point was two minutes and five seconds back, making him very clearly the race leader on the road. The gap increased to two minutes 37 by Foynes (km. 79), and hovered around that mark for quite some time. Behind, BikeAid, KTM and the Swiss National Team were doing most of the chasing and this gradually eroded the break’s advantage. By kilometre 110, 30 kilometres from the line, it was down to just 48 seconds and dropping further. It increased again to 55 seconds with 25 kilometres to go, but more teams joined the chase and once again swung things the other way. The pressure began to tell on those in the break. White was dropped by the other five, with O’Malley slipping back soon afterwards. That left Townsend, van Engelen, van Dalen and Tillet out front and trying to stay clear. The peloton continued to close and as the gap dropped below 20 seconds, the break split and Townsend and van Dalen – who had been the first two to attack hours earlier – pushed on out front. They were finally caught eight kilometres from the finish. Other riders tried to get clear but the sprinters’ teams kept things together. Bugter was quickest in the gallop to the line, with McCarthy best of the Irish and Cigala first county team rider. Bugter builds his advantage in the points competition, while Lukas Ruegg (Switzerland National Team) 15 points is best climber. Paidi O’Brien (Dublin Team Gerard DHL) is best overall Irish county rider, Ghys is best under 23 and Raymond Cullen (Tipperary Panduit) is best category two competitor. The Switzerland National Team is best international squad while Westmeath-Viner-Caremark-Pactimo is best of the Irish teams. 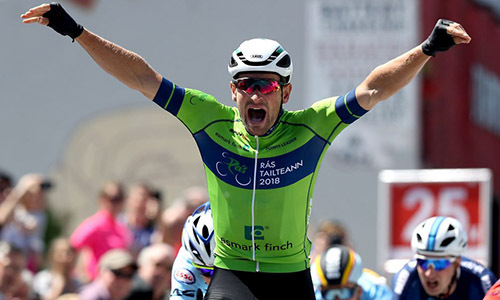 Wednesday’s fourth stage is one of the most difficult of the race, with eight climbs littered along the 153 kilometres between Listowel and Glengarrif. These include the second category climbs of Ladies View, Molls Gap and Garranes, plus the first category Healy Pass.